International Journal of Nanotechnology and Allied Sciences (IJNAS; ISSN: 2523-9252) is an open access, peer-reviewed international journal that considers articles on all aspects of nanotechnology and allied sciences. 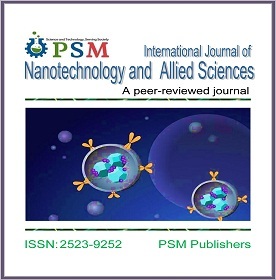 The journal covers all aspects of nanotechnology, nano-sciences, nano-particles formulation, smart drug delivery, nano-physics, photovoltaics and solar cells, nano-toxicology, nano-manufacturing, nano-engineering, nano-biotechnology, biotechnology, microbiology, immunology, green technology, nano-medicine, nano-pharmaceuticals, nano-agriculture, biomedical science, and more. International Journal of Nanotechnology and Allied Sciences (IJNAS) follows publication ethics very seriously and abides by the best practice guidance of the Committee on Publication Ethics (COPE), and the guidelines of International Committee of Medical Journal Editors (ICMJE).